Video clip synopsis – It may be just a small red vinyl suitcase but for Vietnamese refugee Cuc Lam it’s a symbol of a new beginning in a new country. Broadband MP4 cuclamss_bb.mp4 (16.5MB), suitable for iPods and computer downloads. 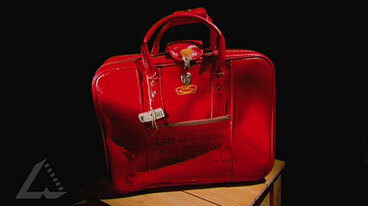 Cuc Lam’s Suitcase is an episode of the series National Treasures produced in 2004. If you were forced to leave your home forever, what would you take with you? Vietnamese refugee Cuc Lam took family photos and jewellery but sacrificed one precious possession to buy a suitcase, now in Melbourne’s Immigration Museum. Cuc Lam talks to Warren Brown about her journey to Australia and how this small red vinyl bag was a symbol of a new beginning in a new country. By 1954, after the defeat of the Japanese and the expulsion of the French in the north, Vietnam was divided into communist North Vietnam and pro-western South Vietnam. The failure of a proposed vote on reunification led to war, which the north won in 1975. The new national government sent many people who had supported the old government in the south to ‘re-education camps’, and others to ‘new economic zones’, where they were treated badly. These factors, coupled with poverty caused by disastrous economic reforms, caused millions of Vietnamese to flee the country, usually by barely sea-worthy boats. These fleeing Vietnamese sold what they could for gold, and took only what they could carry with them. Pirates who raped, murdered and stole almost at will against the defenceless refugees preyed on them. Many ships sank, with the loss of all aboard. Refugees who did survive had to stay in primitive camps in Malaysia, Thailand, the Philippines, Hong Kong, and Indonesia. The plight of the boat people now became an international humanitarian crisis. Several countries agreed to resettle as many as possible of the refugees, and agreed to quotas — the United States of America (823 000), Australia and Canada (137 000 each), France (96 000), and Germany and the United Kingdom (19 000 each). Before 1975 there were approximately 700 Vietnam-born people in Australia. A few refugee boats had reached northern Australia, but most of the Vietnamese refugee resettlement between 1975 and 1985 was by air from the refugee camps in Asia, and was then followed by family reunion under the Family Stream of Australia’s immigration program. By 1981, 43 400 Vietnamese had been resettled in Australia. By 1991 there were 124 800 Vietnam-born in Australia and in the 2001 census, 154 000 people declared themselves as Vietnam-born. You’re forced to leave your home forever and you can only take what you can carry. What would you choose? Make a list. Why is it assumed that family photo albums and precious jewellery would be the items that viewers would save if they had to flee their homes? a) Why did Cuc Lam purchase the suitcase? b) Where is Cuc Lam’s suitcase now located and why is it a national treasure? a) What was in the pouch? b) Why were these Cuc Lam’s most treasured possessions? c) Why did she choose to sell her wedding ring instead of another item from her pouch? a) Why did Cuc Lam have to leave Vietnam? b) What are the connotations of the following words that are used during the film: ‘escape’, ‘fled’, ‘rescued’, ‘voyage’, ‘refugee’, ‘accepted’? In what ways do these words reflect Cuc’s sense of belonging at various times? c) How did Cuc Lam and her husband disguise themselves when they fled? d) Contrast what Cuc Lam wears during the interview with the outfit that is held in the museum? e) To what extent does a person’s choice of clothing reflect their sense of belonging? a) What is the purpose of including archival footage in this video clip? b) There are two different montages of archival footage used: that of the refugee camp and that of the refugees arriving in Australia. What different notions of belonging are invoked by each? List the different ways the presenter draws together the different elements of the story to ensure that they ‘belong to’ the text. Imagine you are Cuc Lam fleeing Vietnam. Compose a series of three to five journal entries that reflect your changing sense of belonging in the course of your journey.